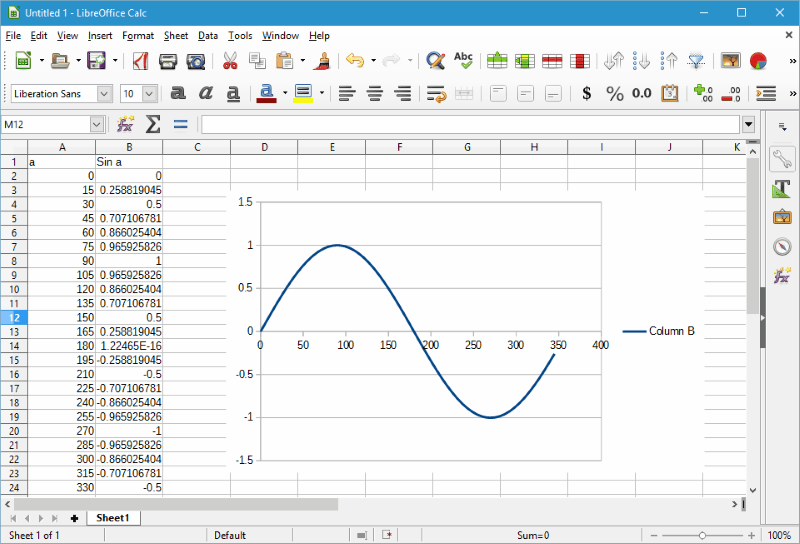 Here is a list of Best Free Graphing Software for Windows. 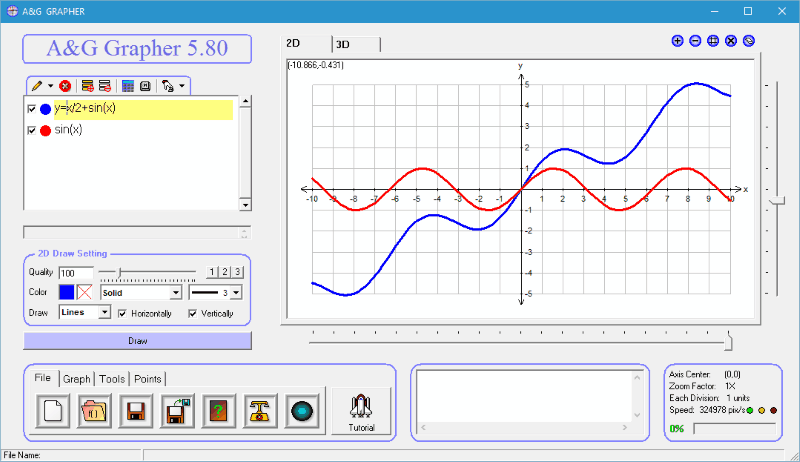 These graphing program let you create graph for various mathematical equations, functions, data sets, inequalities, etc. pretty easily. You can choose degree and radian modes to calculate data and plot graph according to them with these freeware. 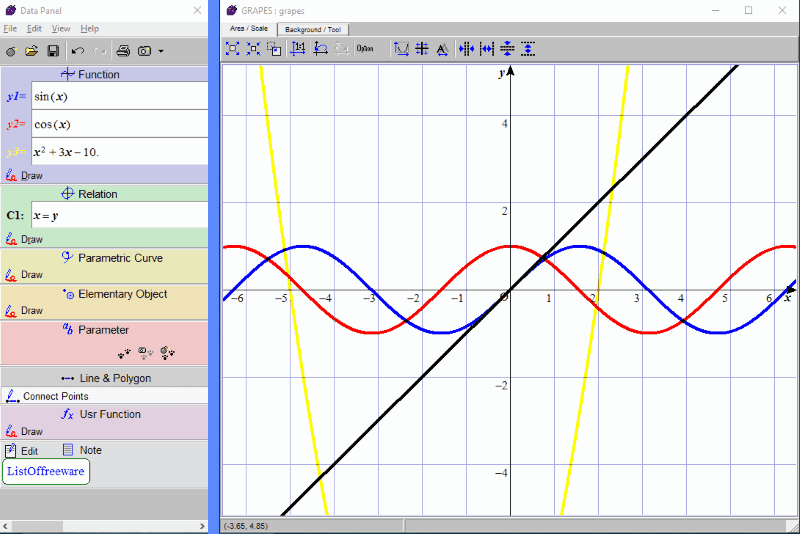 The types of functions you can plot graphs for with these software are: polar functions, parametric functions, standard functions, trigonometric functions, logarithmic functions, etc. Some of these graph maker software give you options to plot 2D graph, 3D graph, polar graph, and Cartesian graph. Graph properties can also be set by limiting axis, defining start point and end point, changing graph color, inserting grid lines, etc. In some of these freeware you only get to plot graph for one equation, but most of them offer options to plot graph of multiple equations. 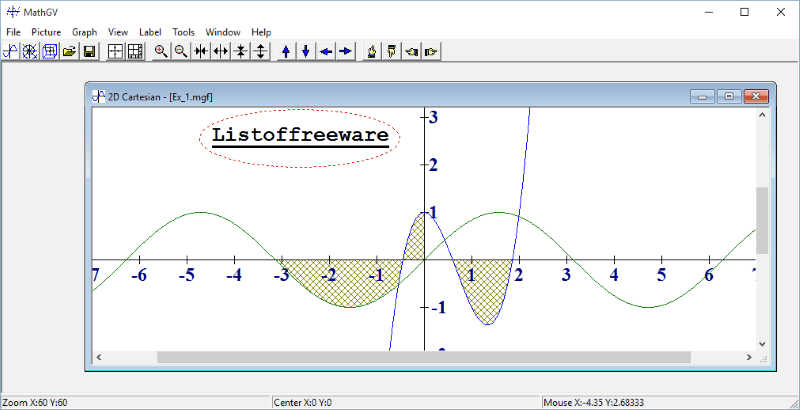 Some of these freeware are dedicated Graphing program and some are integrated with simple and complex math software. All of the graphing programs mentioned here are absolutely free to use and have been described briefly below. You will also get to know how to make a graph using these freeware. photon and Graph are my favorite Graphing programs, as these software are dedicated graphing software. 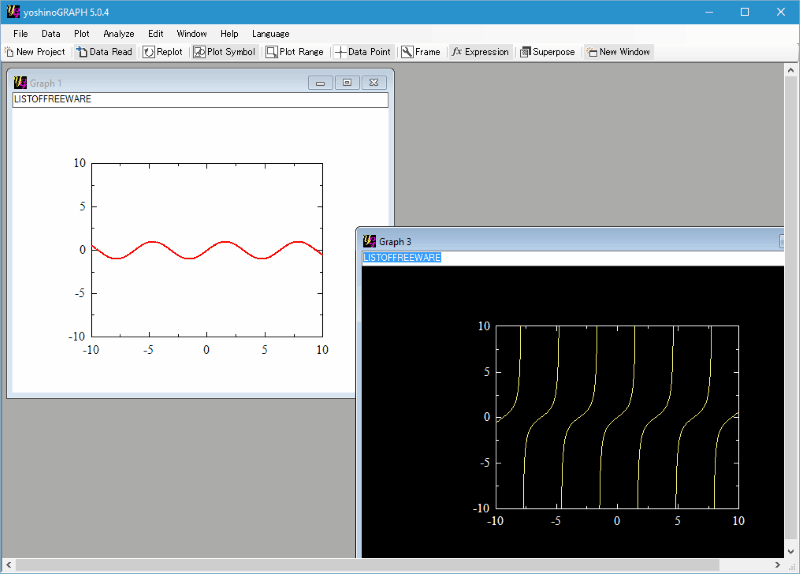 These can render graphs for multiple equations and can process various types of functions as well. These are extensive tools and let you save graphs in image formats as well. Checkout more about these freeware below. 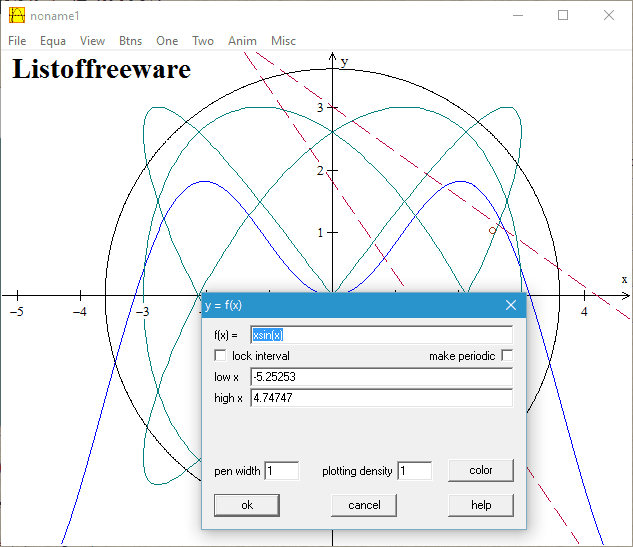 You can also checkout the List of Best Free Math Software, Best Free Scientific Calculators, and Best Free Integral Calculator Software For Windows. Trigonometry: degree to radian, radian to degree, sin, cos, tan, sinp, cosp, tanp, etc. Inverse Trigonometry: asin, acos, atan, asinp, acosp, atanp, etc. General Arithmetic: absolute, sqrt, exponent, natural, log 10, mode, fraction, etc. Integer: convert bin, oct, hexa, round , integer, factorial, permutation, combination, etc. Complex: iadd, isub, imul, idiv, and isqrt. Vectors: dot product, cross product, convert to magnitude, convert to 3D magnitude, convert to vector, convert to 3D vector, etc. Apart from rendering graphs using equations, you can also create a graph manually. After manually creating a graph, the corresponding equation is displayed on the interface. Graph can be save in .photon, .png, .gif, .bmp, .jpg, etc. formats. Graph is another good graph generator software for Windows. It lets you insert function, shading, inverse function, point series, relation to create a graph. You can select a function type from polar function, parametric function, or standard function. Now enter function equation, argument, start point, end point, graph property (color, line style, and draw type (automatic, dot, and line)). Once all the parameters are set, the graph is displayed on the right side of the interface. Supported functions are: Trignometric, hyperbola, power, logarithm, complex, rounding, piecewise, etc. Graph can be saved as .grf. 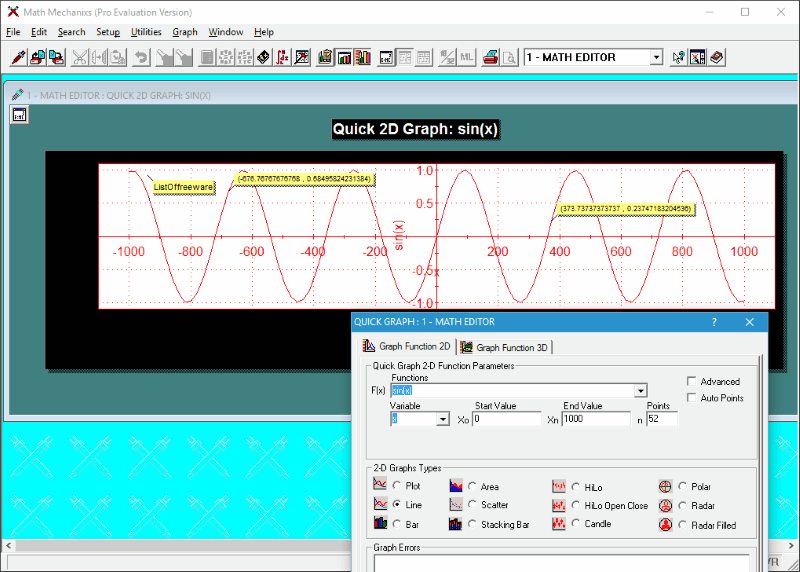 GraphCalc is a free graph generator software which can draw 2D and 3D graphs. You can enter multiple functions and view their output graphs simultaneously. It lets you enter up to 10 equations to render graph. All the equations are designated different colors to display output. Enter Base, Trigonometric, Logarithmic, Root, Power, etc. equations to get output as graph. Degree and Radian modes can be selected to process equations. A 2D graph can be plotted in Euclidean Coordinates, Polar Coordinates, or Parametric graphs. You can select a function from the list of functions, which includes: Floor, ceil, fib, min, max, gcd, lcm, mod, round, log, sin, cose, tan, power, sqrt, etc. Option to calculate graph area is also available. Graphs can be saved as Bitmap. 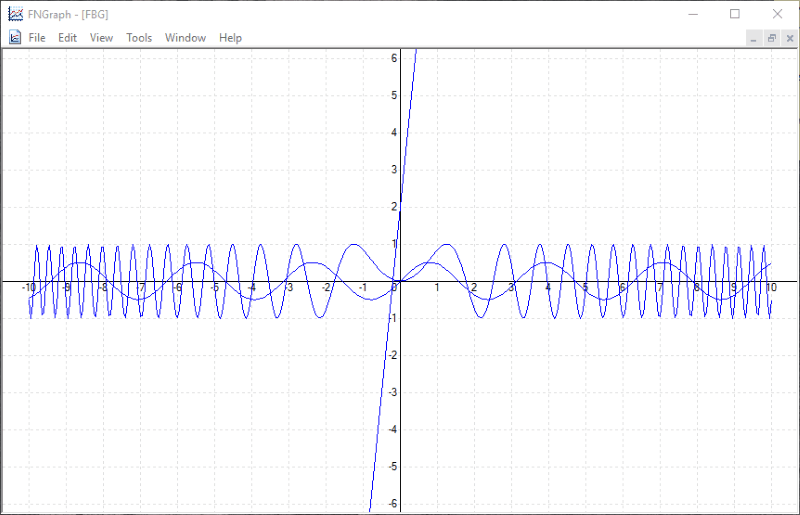 Graphing Calculator is an awesome software to plot graph on PC. You just have to enter equation in the Input Box and click Plot to create graph for the equation entered. Click the Integrate button to Integrate the entered function. You can plot multiple graphs at the same time for various equations. The graphs are displayed in different colors. You can even define a range for the graph. All the equations plotted are added to the Plotted Expression section. Here you can Delete, Hide, and Clear the equations. You can save an expression as XML file to view them later. View equation log as TXT file. MathGV lets you plot graph for free. You can plot Polar graph, 2D Cartesian graph, and 3D Cartesian graph. To make a graph, you can use 2D function or parametric function. When you enter an equation to render graph, you can set color, line width, and upper & lower bound values. It lets you change page size, add text, and change font/graph colors. Various shapes can be added too. Save the graph as .mgf. Graph can be exported in .jpg and .bmp formats. Find few examples for graphs on the homepage. 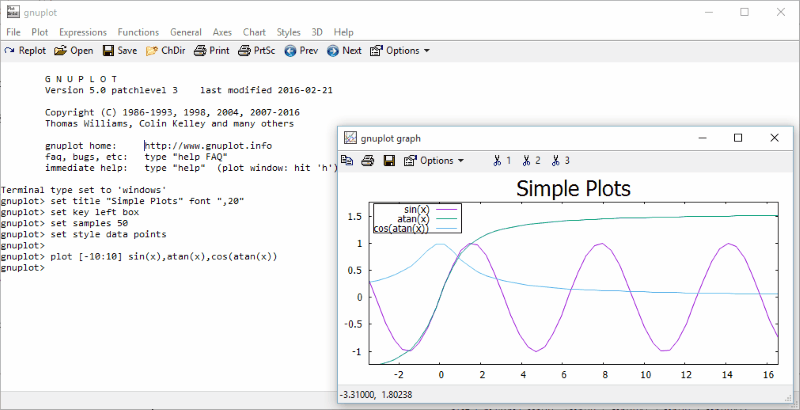 gnuplot is another free graphing program for Windows. It is a well known DOS based graphing software and a bit complex to use. 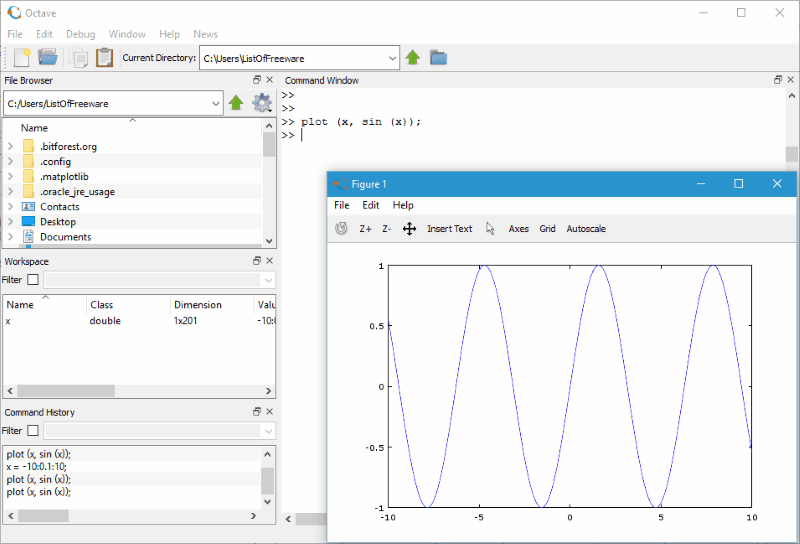 It lets you plot 2D as well as 3D graphs through expressions, equations, and functions. You can enter the following expressions to get a graph: Complex number, unary, binary, logical operator, etc. There are various types of functions that you can run to make graph. These functions include Elementary and Special functions. Elementary Functions: Random, absolute, integer, floor, ceiling, sqrt, exponent, log, trigo, hyperbolic, imaginary, real, etc. Special Functions: Error, error c, inv error, gamma, igamma, lgamma, bessel, etc. To plot graph on this software, you will have to enter certain commands. Through these commands you will be defining type of plot, font size, expression type, functions, etc. You can checkout the Tutorial and Learning page to explore the vast resources to learn how to make a graph using gnuplot. A Demo Webpage lets you view various simple as well as complex graph plot samples. All the plotted graphs can be saved in .plt format. 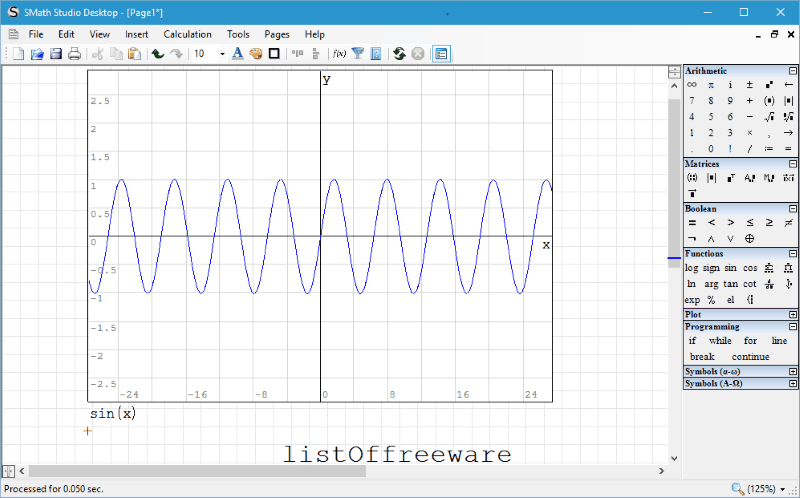 Octave is another script based graph generator for Windows. All you have to do is, type script in the Command Window to get output. The script will contain the command to plot and the function to plot. When you write down a script to plot graph, you can save it as Workspace, which can be loaded later. Another good feature of this software is that, you can load command history. This graphing software gives you option to configure axis, plot 2 dimensional function, and plot 2 dimensional geometric shapes. One can easily learn how to make a graph on this software. Visit this Webpage With Sample Commands and Graph to know more. Euler Math Toolbox is another simple tool to create a graph. It has very interesting useful options to make use of while plotting a graph. The interface opens with two windows; one for entering equations as syntax and another to display the plotted graph. Enter script for equations to plot a graph. Script can be saved and the plotted graph can be exported as PNG or SVG. You can also insert LaTex equations to the graph. Options to set parameters for graphics, aspect ratio, symbols, and syntax are also available. Checkout the Examples webpage to view some samples. Here, the first command sets value of Sin, and the second command is the equation to be plotted. 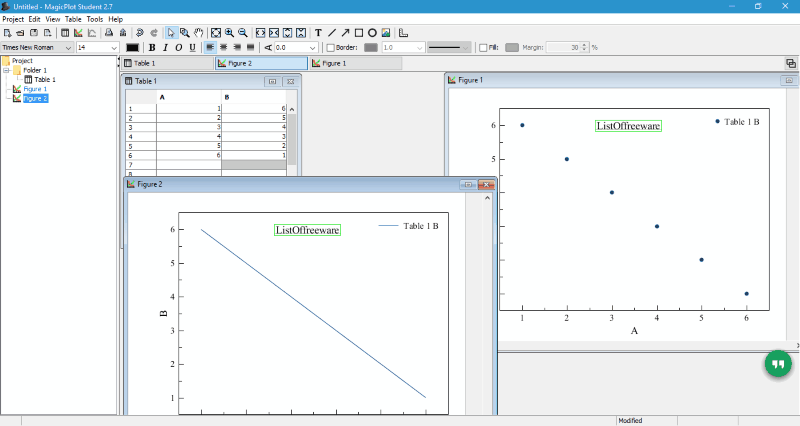 MagicPlot Student is the free version of graphing software MagicPlot Pro. It is a multi-platform software and can be downloaded for Windows, Mac, and Linux. As the website says, this is a data analysis, plotting, and nonlinear fitting software. It can be used to plot a graph for various mathematical functions and equations. Graphs can be plotted under projects. Enter coordinate points of graph in the table. Right click on the table and choose Create plot or Create Fit Plot. Choose either of the options to plot the graph: Line, marker, or Line & Marker. The graph will be plotted in a new window. Now you can save the project, create a new project, and even export the graph rendering as PNG, BMP, or GIF. The free version is only for personal and educational use only. Few features disabled for free version are: vector image export, custom fit equations, multiple axes, color map plots, batch processing, etc. 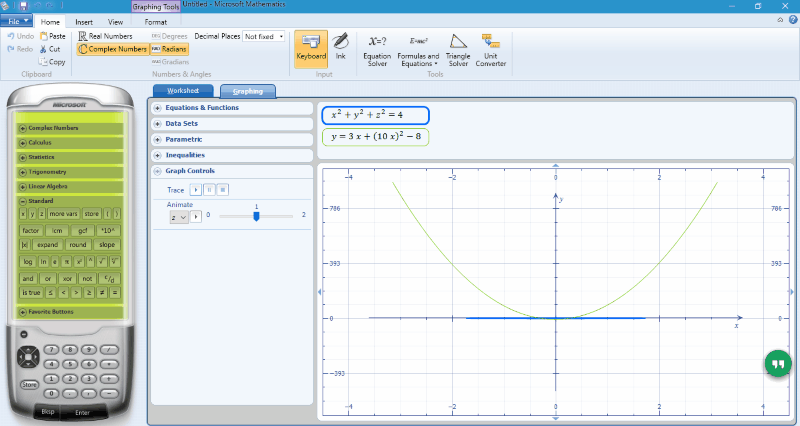 Microsoft Mathematics is a free maths software for Windows by Microsoft. You can use this tool to easily plot graphs. On the interface of the calculator, there are two options: Worksheet and Graphing. There are options to make graph for equations and functions, data sets, parametric, and inequality. You can either plot 2D, 3D, Polar, or Cartesian graph. While making a graph, you can add multiple equations to plot their graph rendering. Select an equation type, then enter values to plot graph. There are options to zoom in/out coordinates, hide axis, hide frame, define plotting range, etc. Graphs can be saved in GCW format. GRAPES is an easy to use graphing software for Windows. It is a dedicated graphing program with options to plot various graphs. On the left section of the interface, you will find options to enter functions, relations, parametric curve, and elementary object. You just have to enter the equation you want to plot, then click on Draw to plot the graph. Multiple expressions can be plotted at the same time. Once a graph is plotted, output can be saved in .bmp, .jpg, .gif, .emf, and .wmf formats. 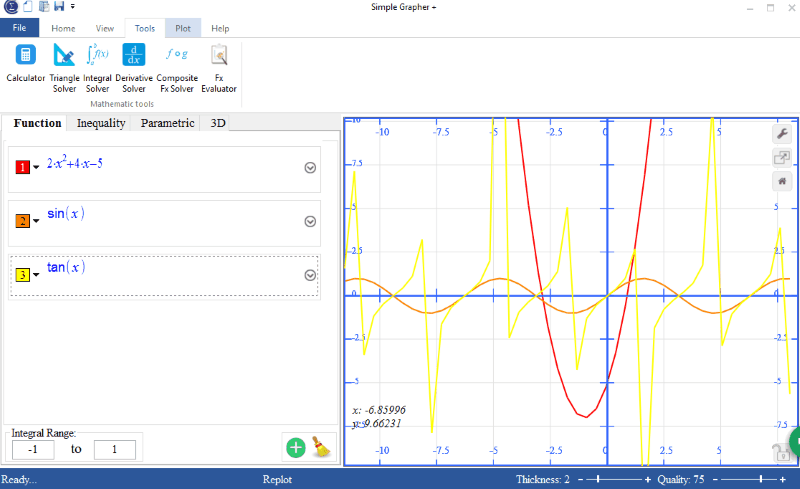 MathGrapher is another free graphing program. Graphs can be drawn for Functions, data, curve fitting, iteration, matrix, L-system, and cellular automata. You can enter data to plot graph with after you have selected an option. In case you want to plot graph for a function, select Functions from the dropdown. Then enter the equation in the text box which you have to plot. Multiple functions can be added to get a graphical rendering in the same graph. You can even add values to functions. Click on Prepare/Draw to set graph properties and to plot graph. Here you can select if you want to draw 2D or 3D graph, set min and max values of coordinates, etc. Click on Draw Graph to render the graph. Functions can be saves as .fct, data can be saved as .grd, and graphs can be exported as .bmp, .jpg, .eps, .png, or .mwf. 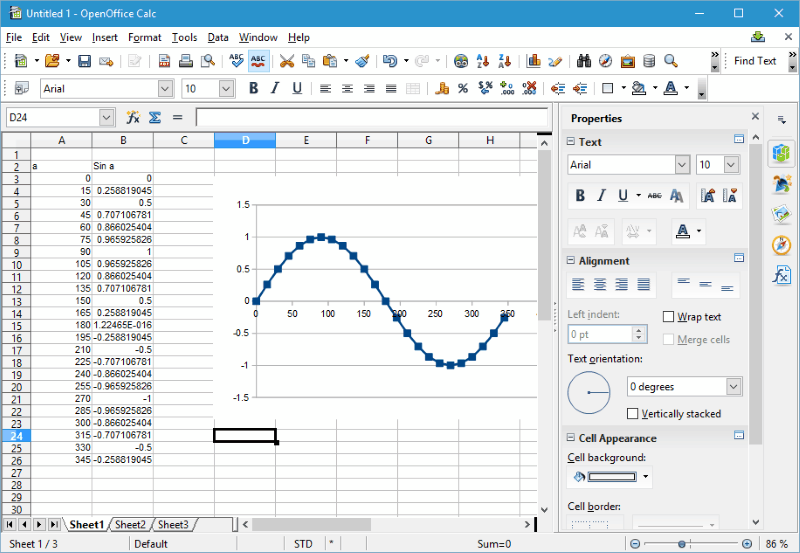 OpenOffice Calc is the spreadsheet software of OpenOffice Suite. Its very easy to create a graph in spreadsheet software with the help of formulas. Simply put data in Rows and Columns to plot graph. You can also generate data for various equations. For example, I have plotted a graph for Sin function. So, I added the values of different angles from 0 to 360 degrees in column a. Now in the column Sin a, I have assigned the formula for Sin of values in a column. When the sin of all angle values are calculated and displayed using the formula, select both columns and go to the Graph Tool. The path is Insert>Chart>Select Chart Type. Here I have selected the XY scatter type to plot graph. There are other graphs as well which you can try your hands on. To calculate values for equations, simply add the formula in a column along with values to plot a graph. Color of render, background, and foreground colors can be changed as well. Save data as .ods, .ots, .xls, .csv, .html, .xml, etc. LibreOffice Calc works the same way as OpenOffice Calc does. All you have to do is enter values to be plotted in columns. To render the values you can insert formulas and equations in spreadsheet. Then, create a graph exactly like I explained above. Select the columns with data, then go to Insert>Chart>Select Chart Type (XY scatter). Apart from XY scatter, you can also plot various other type of graphs: column, bar, pie, area, line, bubble, net, stock, etc. 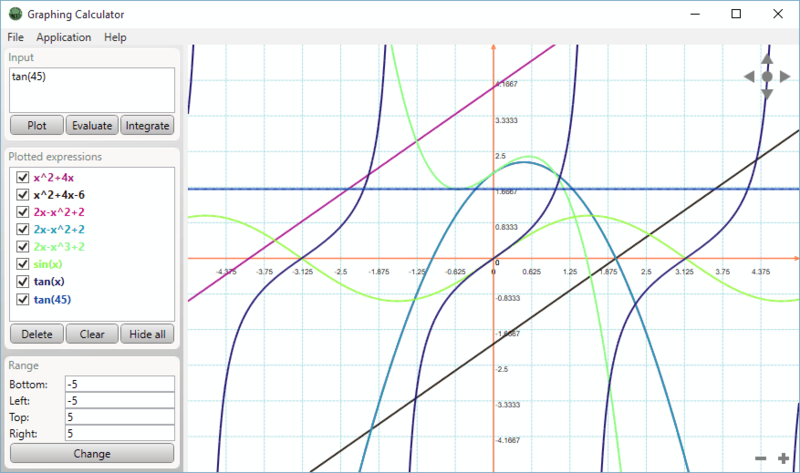 Math Mechanixs is a free math tool where you can solve simple or complex mathematical equations and can also plot graphs. The Quick Graph option lets you enter equation, variable, end value, and start value to plot graphs. The available graph types which can be plotted are: plot, line, graph, area, scatter, hilo, candle, polar, radar, and radar filled. You can enter a note and set label points in a graph. SMath Studio is another good graphing software, which is primarily a math tool. Making a graph here is pretty easy. Go to Insert> Plot. Here you can choose to plot 2D and 3D graphs. A workspace is created, where you can enter an equation or function to plot resulting graph. Option to insert text to graph is also available. Graph rendering can be saved as .jpg, .png, .bmp, .gif, etc. The interface displays a list of Arithmetic, Matrices, Boolean, Functions, and Programming options to be used in mathematical calculations. Simple Grapher Plus is a simple math software, which can help you create a graph. To plot a graph, go to the Plot tab. There you can enter either Function, Inequality, Parametric, or 3D curves. You can add more than one function to plot multiple graphs at the same time. Export graph as .png, .jpg, or .bmp. 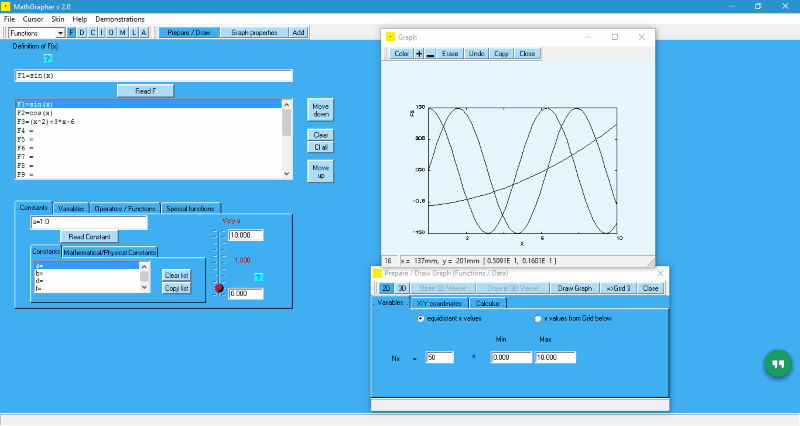 Other tools available on this freeware are Calculator, Triangle solver, Integral solver, Derivative solver, Composite function solver, and Fx evaluator. Math Solver as the name suggests, solves mathematical problems. Enter an equation to solve in the input text box, then click the Insert button. This will inset the equation for evaluation. You can add multiple equations to plot graph as well. After adding equation(s), click on Solve to view the corresponding graph. The graph is displayed in a separate window. You have the option to enter functions, constant values, and last inserted functions. Error log displays the functions that were not solved. DeadLine is an easy to use graphing software. Graphs can be made under new projects here. A popup window appears, enter equation, parameters, intervals, then click OK to create a graph. It also gives you options to calculate derivative, double derivative, and integration of an equation. Equations can be saved as .ddl file. Winplot lets you plot graph for various equation types. This includes: Explicit, parametric, implicit, polar, points (x,y), segment, recursive, polynomial, and differential equations. Click on Equa option to enter a function, values, intervals, and line density. Graphs can be exported as .eps, .svg, .bmp, and meatfile. Password protection option is also available. DreamCalc is a scientific calculator software for Windows. Here you can draw graph and perform various other calculations for simple math functions, trigonometry, logarithm, permutation, combination, etc. 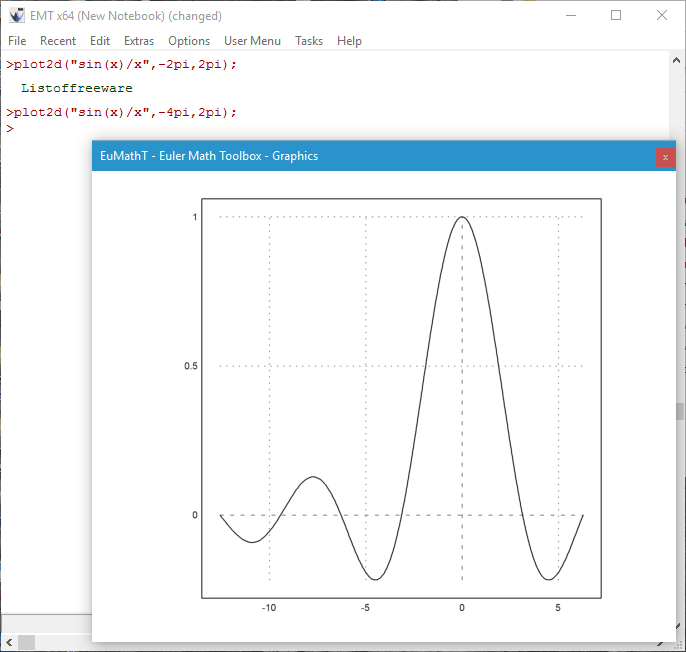 Go to Windows>Graphing & List to open a pop up window, where you can make a graph. Enter function value, enter range, then press the Enter button to render graph. You can view the integral, derivative, and even X-intercept of the function you made the graph for. Graph can be saved as .csv or .txt file. 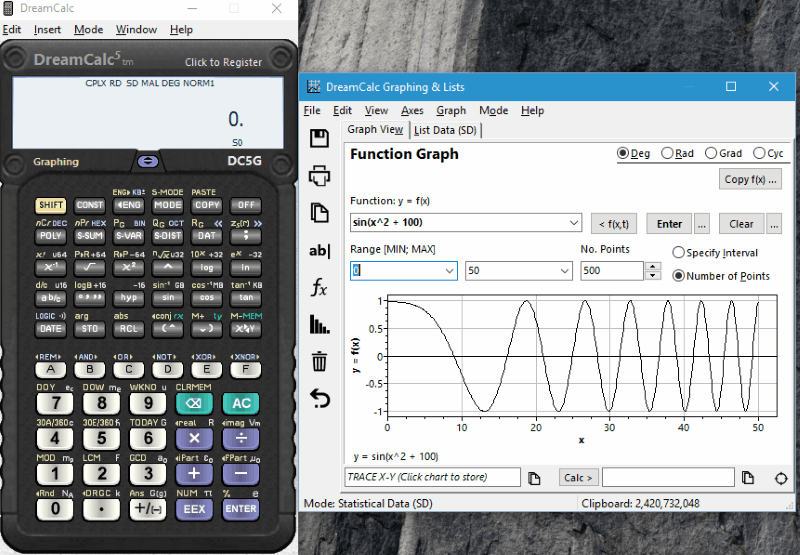 XGRAPH is a dedicated free graphing program. Plotting graph with this freeware is pretty easy. All you have to do is, go to Options > Plot Equation, then enter the equation to plot in the text box. Click on Plot It to render the graph on the UI. Change the color of graph if you want to, set minimum and maximum points, change thickness of rendering, etc. Plotted graph can be exported as .ppm, .jpg, .png, or .gif files. You can even add text to the graph. 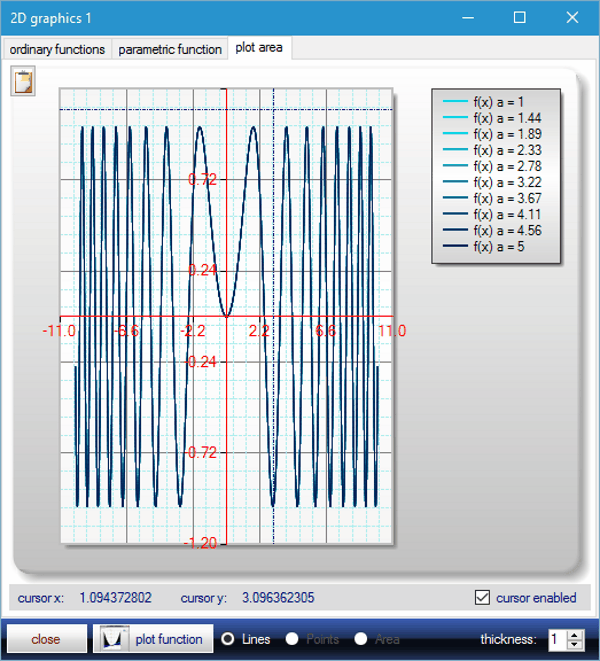 FNGraph is a simple graphing software. It lets you add multiple functions to render multiple graphs at a time. Go to Graph option, then add single or multiple equations to render graph. You can evaluate y-coordinate value at any point of x-coordinate and vice versa. ZGrapher lets you plot graph for multiple equations at a time. It also gives you option to export plotted graph as image files. When you enter an equation to plot a graph, you can select graph line style, color, etc. Apart from graph, you can calculate derivative, value table, tangent and normal, integral, and regression of an equation. Export images as: .pcx, .bmp, and .gif. Datascape is another simple graphing program for Windows. Press F8 to enter equation and then render it on graph. Grid-lines can be applied to the graph and colors can also be changed. The graph data can be saved as .dat or .txt file. A&G Grapher lets you plot graphs for entered equations and also solves various mathematical problems. Graph can be plotted with points or lines. Axis range can also be setup. For a graph, quality, color, and line parameters can be changed. Add multiple equations to plot their graph simultaneously. Both 3D and 2D graphs can be created. yoshinoGRAPH lets you create a graph under project. It lets you set graph range, change color of graph, add note to graph, merge graphs, etc. 2D and 3D graphing options are available. There are various types of functions that can be plotted with this free graph maker software, which includes trigonometric, quadratic, logarithmic, etc. equations. fx-calc is a free calculator software which lets you plot graph for free. It lets you solve various mathematical problems as it is a scientific calculator software. Click on fx graph button to plot a graph. You can either create a graph for ordinary functions, parametric functions, or plot area. Its might look complex, but is easy to use.